The Chinese government has issued a strong denial of reports that its long-standing ban on openly worshipping the Dalai Lama has changed. 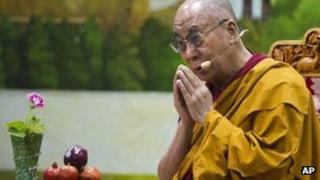 It comes after reports that restrictions on worshipping the Dalai Lama had been eased in some areas. In a statement to the BBC, the state bureau for religious affairs said there had been no policy change. The Dalai Lama, the spiritual head of Tibetan Buddhism, fled in 1959 after a failed uprising against Chinese rule. Persistent reports from Tibetan advocacy organizations, including Free Tibet and the US-funded broadcaster, Radio Free Asia, indicated that an "experimental" policy allowed the open worship of the Dalai Lama in some Tibetan monasteries. However, the BBC was unable to confirm this news, despite repeated phone calls to monasteries in Lhasa, the capital of the Tibetan Autonomous Region, and Tibetan areas in the provinces of Qinghai and Sichuan. Several monks admitted they had heard of possible changes to the government's long-standing policy, but said they had not witnessed any relaxation in policy themselves. Portraits of the Tibetan spiritual leader are still banned, the monks explained. Only officially sanctioned images of the Buddha are permitted to be displayed, one monk in Lhasa confirmed today. For years, senior Communist officials have infuriated Tibetan Buddhists by referring to the Dalai Lama with a series of derogatory names, the BBC's Celia Hatton in Beijing reports. Zhang Qingli, the Communist Party chief in charge of Tibet until 2011, famously referred to the Buddhist cleric as "a wolf in monk's robes". A report on Radio Free Asia suggested that Buddhists in China's Tibetan areas were able to worship the Dalai Lama openly and that some temples could display portraits of the Dalai Lama and no one was allowed to criticise him. But monasteries contacted by the BBC said they were unaware of any change in policy and, in a faxed statement to the BBC on Friday, the government said that China's policy towards the Dalai Lama was "consistent and clear". "If the Dalai Lama wants to improve his relationship with the Central Government, he must really give up his stance in favour of 'Tibetan Independence' or independence in any disguised forms." He now lives in Dharamsala in northern India, travelling the world to seek support for more rights for Tibetan people. Beijing accuses him of trying to split Tibet, with its separate culture and language, from the rest of China. The Dalai Lama says he only wants greater autonomy.